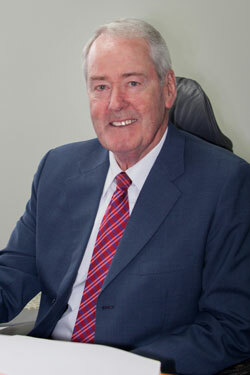 Ron Evans has been practising law in Hamilton since 1964, when he joined Alan Houston and practised in the Courts for seven years before establishing Evans Bailey & Co with Gerald Bailey in 1971. Since then he has been engaged in general practice with particular emphasis on estate planning, trusts, wills, and estate administration. He is a Fellow of the Royal Society for the Encouragement of Arts, Manufactures and Commerce (London), a former horticulturist and kiwifruit exporter, and a foundation member of the Hamilton Kiwanis Service Club. He is also a past board member of the Waikato Diocesan School and past president of the Hamilton Club. Ron is also interested in Western European languages and art – and Asian and Pacific culture, customs, and travel. He also has wide sporting interests and has actively participated particularly in golf, tennis, and athletics.